"Olympiastadion" redirects here. For other uses, see Olympic Stadium and Olympiastadion (disambiguation). During the 1912 Summer Olympics, the city of Berlin was designated by the International Olympic Committee (IOC) to host the 1916 Summer Olympics. Germany's proposed stadium for this event was to be located in Charlottenburg, in the Grunewald Forest, to the west of Berlin—thus the stadium was also known as Grunewaldstadion. 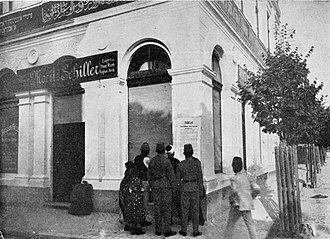 A horse racing-course already existed there which belonged to the Berliner Rennverein, and even today the old ticket booths survive on Jesse-Owens-Allee. The government of Germany decided not to build in the nearby Grunewald forest, or to renovate buildings that already existed. Because of this desire, they hired the same architect who originally had built the "Rennverein", Otto March. March decided to bury the stadium in the ground ("Erdstadion", in German). However, the 1916 Olympic Games were cancelled due to World War I. In the 1920s the first buildings of a school, the "Deutsches Sportforum" (German Sport Forum), dedicated to the teaching of professors of physical education and the study of sport science were built northeast of the stadium site. From 1926 to 1929, Otto March's sons (Werner and Walter) were assigned to build an annex for these institutions, though the finalization was delayed until 1936. In 1931, the International Olympic Committee selected Berlin to host the 11th Summer Olympics. Originally, the German government decided merely to restore the earlier Olympiastadion (Olympic Stadium) of 1916, with Werner March again retained to do this. 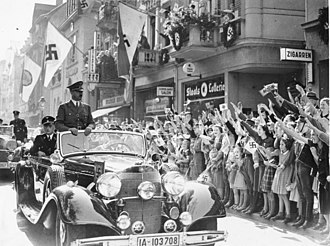 When the Nazis came to power in Germany (1933), they decided to use the Olympic Games in 1936 for propaganda purposes. 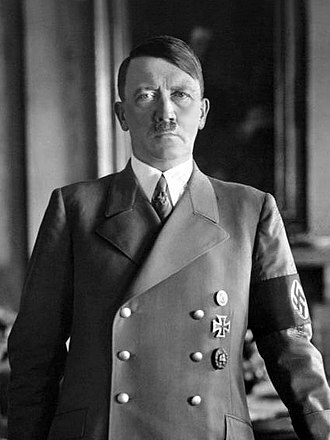 With these plans in mind, Adolf Hitler ordered the construction of a great sports complex in Grunewald named the "Reichssportfeld" with a totally new Olympiastadion. Architect Werner March remained in charge of the project, assisted by his brother Walter. 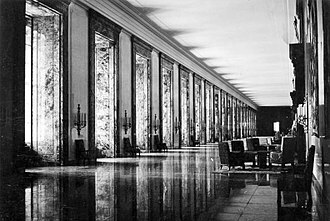 Construction took place from 1934 to 1936. When the Reichssportfeld was finished, it was 1.32 square kilometres (326 acres). 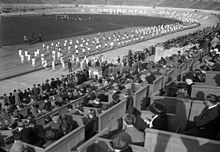 It consisted of (east to west): the Olympiastadion, the Maifeld (Mayfield, capacity of 50,000) and the Waldbühne amphitheater (capacity of 25,000), in addition to various places, buildings and facilities for different sports (such as football, swimming, equestrian events, and field hockey) in the northern part. Werner March built the new Olympiastadion on the foundation of the original Deutsches Stadion, once again with the lower half of the structure recessed 12 meters below ground level. 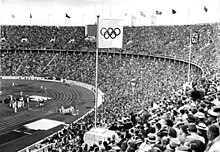 The capacity of the Olympiastadion reached 110,000 spectators. 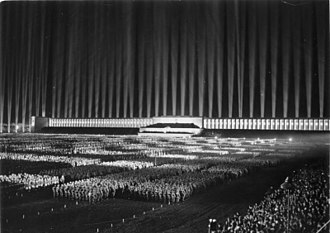 It also possessed a special stand for Adolf Hitler and his political associates. At its end, aligned with the symmetrically-designed layout of the buildings of the Olympischer Platz and toward the Maifeld, was the Marathon Gate with a big receptacle for the Olympic Flame. 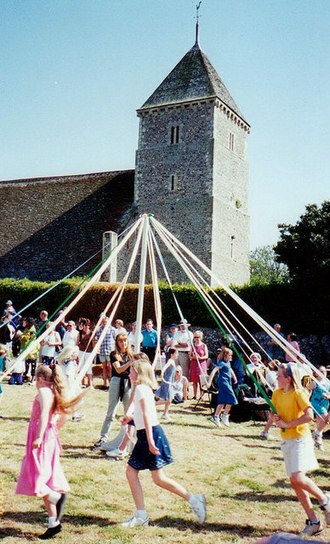 The Maifeld (Mayfield) was created as a huge lawn (112,000 square metres, 28 acres) for gymnastic demonstrations, specifically annual May Day celebrations by the government. The area was surrounded by 19 metres of land elevation (62 ft), even though the Olympiastadion (to the east) was only 17 metres (55 ft) high. 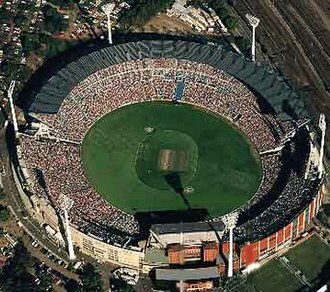 The total capacity was 250,000 people, with 60,000 in the large stands that extended at the west end. Also located there were the Langemarck-Halle (below) and the Bell Tower (rising high). The walls were built with sturdy stone from the area of the Lower Alps, and also feature equine sculptures (work of Josef Wackerle). This consisted of huge halls built under the stands of the Maifeld. Pillars were raised on which hung flags and shields commemorating all the forces that participated in a battle fought in Langemark (West Flanders, Belgium) on 10 November 1914, during the First World War. Since 2006, the ground floor is home to a public exhibit providing historical information on the area of the former Reichssportfeld. During the 1936 Olympics, the Maifeld was used for polo and equestrian dressage events. After the Second World War, the occupying forces of the British Army (Berlin Infantry Brigade) annually celebrated the Queen's Official Birthday on the Maifeld and used it for a variety of sporting activities including cricket. Starting in 2012, Maifeld became home to the Berlin Cricket Club. The Bell Tower crowned the western end of the Reichs Sportfield planted amid the tiers of the Maifeld stands. It was 77 metres (247 ft) high. From its peak could be observed the whole city of Berlin. 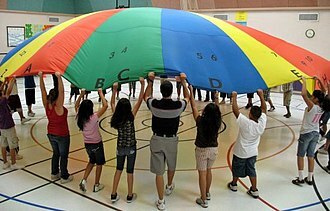 During the games, it was used as observation post by administrators and police officials, doctors and the media. In the tower was the Olympic Bell. 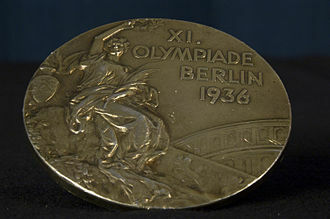 On its surface were the Olympic Rings with an eagle, the year 1936, the Brandenburg Gate, the date 1.-16. 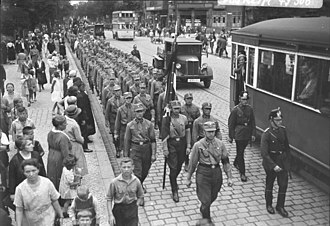 August and a motto between two swastikas: I call the youth of the world and 11. Olympic Games Berlin – although the games were the 10th (Summer) Olympics, they were the Games of the XI Olympiad. The Bell Tower was the only part of the Reichssportfeld that was destroyed in the war. The Third Reich used the tower's structure to store archives (such as films). The Soviet troops set its contents on fire, turning the tower into a makeshift chimney. The structure emerged from the fire severely damaged and weakened. In 1947, the British engineers demolished the tower; however, it was reconstructed accurately in 1962. The Olympic Bell (which had survived the fire and remained in its place in the tower) fell 77 metres and cracked and has been incapable of sounding since then. In 1956, the bell was rescued, only in order to be used as a practice target for shooting with anti-tank ammunition. The damaged old bell survives and serves as a memorial. The recreation of the tower was carried out from 1960 to 1962, once again by the architect Werner March, following the original blueprints. The present tower became an important tourist destination offering a panorama of Berlin, Spandau, the Havel Valley, Potsdam, Nauen and Hennigsdorf. The most significant battle around the Olympiastadion was in April 1945 when the Soviet army fought to capture it. This was during the final battle of the Second World War in Europe, with the total invasion of Berlin as the Allies' target. The Olympiastadion survived the war almost untouched; it only suffered the impact of machine gun shots. After the war, the former Reichssportfeld became the headquarters of the British military occupation forces. The administration settled in the northeastern buildings designed by the March brothers in the 1920s, which the Third Reich had used for official sport organisations such as the Reich Academy of Physical Training and extended by 1936, adding the "Haus des deutschen Sports" (House of German Sports) and other buildings (which belong since 1994 to the Olympiapark Berlin, a central sporting facility of the City of Berlin). Soon, the British forces renovated war-damaged buildings but also converted interiors to their specific needs (one gymnasium was converted into a dining hall, another into a garage). From 1951 to 2005, the Olympischer Platz had a giant antenna transmitting for all the portable radios in Berlin. From then until 1994 and their departure, British forces held an annual celebration of the Queen's Official Birthday in the Maifeld with thousands of spectators from Berlin present. During the 1960s, American military and high school football teams introduced hundreds of thousands of Berliners to American football at the stadium in exhibition games. During those years, Bundesliga football matches were played in the Olympiastadion, with Hertha BSC as local team. In the Maifeld, several competitions of football, rugby and polo were staged too. In the summers, the Waldbühne resumed its classical music concerts, and playing movies. The theatre was also used as an improvised ring for boxing matches. In 1998, Berliners debated the destiny of the Olympiastadion in light of the legacy it represented for Germany. Some wanted to tear the stadium down and build a new one from scratch, while others favoured letting it slowly crumble "like the Colosseum in Rome". Finally, it was decided to renovate the Olympiastadion. FIFA chose it as one of the venues of the 2006 FIFA World Cup. The State of Berlin hired a consortium composed of Walter Bau AG and DYWIDAG that won the €45 million franchise. The consortium took charge of the operation of the facilities together with Hertha BSC and the Government of Berlin after the remodelling. On 3 July 2000, the renovation began with a ceremony presided over by the Chancellor Gerhard Schröder, accompanied by Eberhard Diepgen (Mayor of Berlin), Franz Beckenbauer and Prof. Dr. Ignaz Walter. The re-inauguration celebrations of the new Olympic Stadium were carried out on 31 July 2004, and 1 August 2004. On that day, Saturday, the party began with performances from Pink, Nena and Daniel Barenboim. It culminated at night with the opening ceremony. On day two, friendly matches were played between different categories of the club Hertha BSC and visiting teams. On 8 September 2004, Brazil played Germany. In 2011, the venue hosted the World Culture Festival organized by the Art of Living where 70,000 people meditated for peace. In 2018, the venue hosted the 2018 European Athletics Championships. 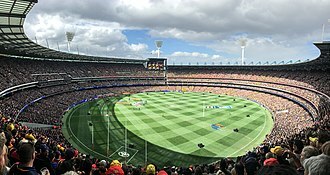 With the intention of creating a more intimate atmosphere for football games, the playing field was lowered by 2.65 metres (8.7 ft). Approximately 90,000 cubic metres (3,200,000 cu ft) of sand was excavated. The lower tier of seating in the stadium was demolished and rebuilt at a completely different angle of inclination. The roof was extended to cover a total of 37,000 square metres (400,000 sq ft), with 20 roof-supporting columns carrying a weight of 3,500 tonnes (3,900 short tons) of steel. The roof rises 68 metres (223 ft) over the seats and is made up of transparent panels that allow sunlight to stream in during the day. The western portion (on the Marathon Arch) is open to reveal the Bell Tower to the spectators. The conservation factor of the Olympiastadion as a historical monument was also considered, especially with respect to the preservation of the natural stone blocks. After criticisms, the colour of the athletics track around the game field was changed from red to blue, reflecting the colours of Hertha BSC. The renovations used 70,000 cubic metres (2,500,000 cu ft) of concrete and 20,000 cubic metres (710,000 cu ft) of pre-cast reinforced concrete elements. Some 12,000 cubic metres (420,000 cu ft) of concrete was demolished and removed and 30,000 cubic metres (1,100,000 cu ft) of natural stone was refurbished. The Olympiastadion was equipped with the latest technology in artificial illumination and sound equipment. It has 113 VIP stands, a set of restaurants, and two underground garages (for 630 cars). 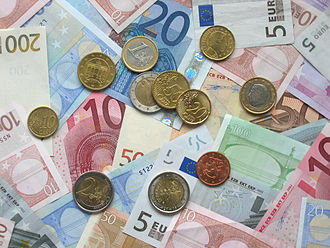 The total cost of the remodelling and amplification was €242 million. The new Olympic Stadium has the highest all-seated capacity in Germany. It has a permanent capacity of 74,475 seats. The upper tier has 31 seating rows at an average slope of 23° and houses 36,455 seats, of which 36,032 are regular seats, 290 are seats on the press stand and 133 are seats in skyboxes. The lower tier has 42 seating rows at an average angle of 25,4° and houses 38,020 seats, of which 32,310 are regular seats, 560 are box seats, 563 are lounge seats (expandable to 743), 4,413 are business seats and 174 are wheelchair spaces. For certain football matches, such as those between Hertha BSC and FC Bayern München, the capacity can be temporarily expanded. This is made by the addition of mobile grandstand over the Marathon Arch. The extended capacity reached 76,197 seats in 2014. The only stadiums in Germany that have higher total capacities are the Signal Iduna Park in Dortmund and the Allianz Arena in Munich. However, the Signal Iduna Park and the Allianz Arena have both seating and standing areas, and their all-seated capacities are lower than that of the Olympiastadion. The total capacity of the Allianz Arena is also lower than the extended capacity of the Olympiastadion. The stadium has been used as the home venue for the Bundesliga's Hertha BSC since 1963. In 1963, the Bundesliga was formed, and Hertha BSC participated by direct invitation, leaving its old stadium (the "Plumpe") to use the Olympiastadion. On 24 August, it played the first local match against 1. FC Nürnberg, with the final score 1–1. However, in 1965, the German Football Association found Hertha BSC guilty of bribery and relegated them to the Regional Leagues. In 1968, Hertha returned to the first division, and to the Olympiastadion, and in 1971 sold "Plumpe". The second half of the 1970s was quite successful for Hertha BSC Berlin. In 1979, it reached the semifinals of the UEFA Cup, but was defeated by Red Star Belgrade. Hertha reached the finals of the German Cup twice (1977 and 1979). In the 1980s, Hertha had a declining role in the Bundesliga, and fell to the Regional Leagues in 1986, although they later recovered reaching the Second Division (1988–1989). With the demolition of the Berlin Wall in November 1989, a spontaneous feeling of sympathy between Hertha and 1. FC Union Berlin from Eastern Berlin arose, which culminated in a friendly match at the Olympiastadion with 50,000 spectators (27 January 1990). In 1990, Hertha returned to the First Division, although it fell again to the Second Division from 1991 until 1997. Since 1997, the club has improved, climbing up the Bundesliga table and qualifying for the UEFA Champions League, with matches against top European teams like Chelsea and A.C. Milan. Ahead, left to right: Asafa Powell, Tyson Gay and Usain Bolt, 2009 in Berlin. The Olympiastadion held the world record for the attendance of a baseball game during the 1936 Olympics thought to be over 100,000. Since 1985, the stadium has hosted the finals of both the DFB-Pokal and its companion women's tournament, the Frauen DFB Pokal. However, it did not host the 2010 final of the Frauen DFB Pokal, which was held at Cologne's RheinEnergieStadion as part of an experimental test to host the event in a different city. The stadium hosted five American Bowls between 1990-1994. The stadium was also home to Berlin Thunder, an American football team in NFL Europa, from 2003 until the league's operator, the U.S. National Football League, closed down the money-losing competition in 2007. The stadium also hosted The World Culture Festival. 2011 was to celebrate 30 years of service to humanity by Art of Living Foundation. The stadium also hosts the Internationales Stadionfest, which also served as an IAAF Golden League event until 2010. The future of the event is currently unknown. The stadium hosted the 2009 World Championships in Athletics where Usain Bolt broke the 100 metres and 200 metres world records. 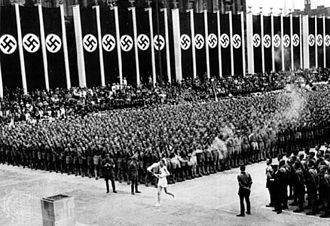 On 1 August 1936, the Olympics were officially inaugurated by the head of state Adolf Hitler, and the Olympic cauldron was lit by athlete Fritz Schilgen. Four million tickets were sold for all the events of the 1936 Summer Olympics. This was also the first Olympics with television transmission (25 viewing spaces were scattered all over Berlin and Potsdam) and radio transmissions in 28 languages (with 20 radio vans and 300 microphones). While the Olympic flame had been used for the first time in Amsterdam 1928, in Berlin 1936 a marathon-like tour of the Olympic torch was introduced, from Olympia in Greece, crossing six frontiers with a journey of 3,000 kilometres (1,900 mi) to Berlin, through Greece, Bulgaria, Yugoslavia, Hungary, Czechoslovakia, Austria and Germany. The original idea of this Olympic torch relay was Carl Diem's, who was a political advisor to Propaganda Minister Joseph Goebbels, specialising in Olympic affairs. The Olympics were the subject of the propaganda film Olympia (1938) by Leni Riefenstahl. Among the sport competitions, one of the most memorable events was the performance of the African-American track and field athlete Jesse Owens, representing the United States of America. 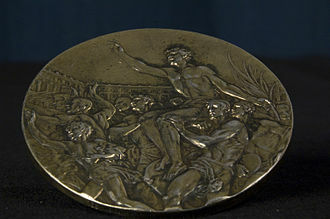 Owens won the gold medal in the 100, 200, long jump and 4 x 100 relay. One of the main streets outside the stadium is named Jesse Owens Allee in recognition of his performance. The stadium also hosted the equestrian jumping, football, and handball events. Three matches from Group A (West Germany, Chile, East Germany and Australia) were played in the Olympiastadion. The third match, Australia vs Chile, was played in torrential rain. 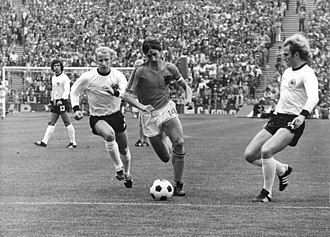 The historic match between the two German teams, however, was played in Hamburg. 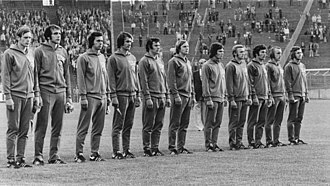 The hosts, West Germany, won the tournament. In 2011, the Olympiastadion hosted Germany's opening match in the 2011 FIFA Women's World Cup. It was the only match in the tournament to be contested at the stadium. In May 2013, the Olympiastadion was chosen as the venue for the 2015 UEFA Champions League Final. FC Barcelona won their fifth title and completed a second treble. 10 June 2009 Depeche Mode M83 Tour of the Universe 65,657 The concert was recorded for the group's live albums project Recording the Universe. 9 June 2013 Depeche Mode Trentemøller The Delta Machine Tour 66,388 Part of the performance of "Should Be Higher" from the concert was filmed for the music video of the group's single. The audio is from the performance of this show. 4 July 2015 Helene Fischer Farbenspiel Live Tour 2015 120,000 The two concerts were filmed for the Fischer's concert film Farbenspiel Live: Die Stadion-Tournee. The stadium was used as a location scene in the cinematic cold-war spy drama The Quiller Memorandum (1966). The map of the venue. The underground train (U-Bahn) U2 takes visitors directly to the station Olympiastadion. It's a short walk from there to the stadium (East Gate entrance: 500m, South Gate entrance: 870m). Average travel time: 14 minutes from Zoologischer Garten, 24 minutes from Potsdamer Platz, 34 minutes from Alexanderplatz. The regional train (S-Bahn) S5 takes visitors directly to the station Olympiastadion. It's a short walk from there to the stadium (South Gate entrance via exit Flatowallee: 200 m, East Gate entrance via exit Trakehner Allee: 250m). Average travel time: 7 minutes from Spandau station, 14 minutes from Zoologischer Garten, 22 minutes from Friedrichstrasse, 26 minutes from Alexanderplatz. With the bus lines M49 and 218 visitors can reach the stop Flatowallee. It's a short walk from there to the stadium. With the bus line 104 visitors can reach the underground station Neu-Westend. From there its a walk directly to the stadium. Visitors also can take the underground train and exit at the station Olympiastadion. "Olympic Stadium Berlin" by Andreas Janowski. Published by Andreas Janowski Verlag under the label "sights-on-audio"
1936 Summer Olympics official report. Volume 1. pp. 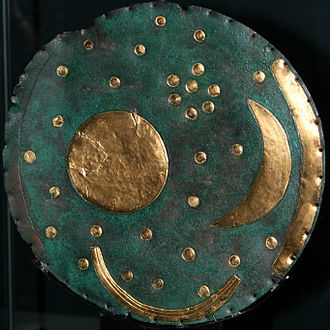 141–9, 154–62. ^ a b c "Stadion". olympiastadion-berlin.de. Berlin: Olympiastadion Berlin GmbH. n.d. Archived from the original on 12 March 2017. Retrieved 11 March 2017. ^ Muir, Fabian (12 May 2012). 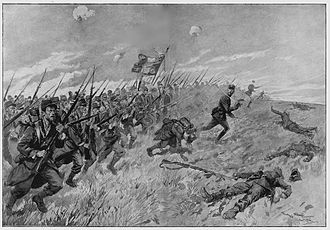 "The past was war, the future is cricket". Cricinfo Magazine. Retrieved 12 May 2012. ^ Clearly, Lisa. "Ravi Shankar's Mass Meditation for World Peace: 70,000 Gather at World Culture Festival". HuffingtonPost.com. Retrieved 8 March 2016. ^ ""Match report – Germany FR – Chile"". FIFA.com. 14 June 1974. Retrieved 6 October 2015. ^ ""Match report – Germany DR – Chile"". FIFA.com. 18 June 1974. Retrieved 6 October 2015. ^ ""Match report – Australia – Chile"". FIFA.com. 22 June 1974. Retrieved 6 October 2015. ^ "Match report – Italy – France". FIFA.com. 9 July 2006. Retrieved 13 July 2014. ^ "Berlin to Host 2015 Final in Olympic Stadium". Der Spiegel. 23 May 2013. Retrieved 26 February 2014. Picture galleries: An illustrative walk along the facilities of the Olympischer Platz. Charlottenburg-Wilmersdorf is the fourth borough of Berlin, formed in an administrative reform with effect from 1 January 2001, by merging the former boroughs of Charlottenburg and Wilmersdorf. Charlottenburg-Wilmersdorf covers the city centre of Berlin and the adjacent affluent suburbs. It borders on the Mitte borough in the east, on Tempelhof-Schöneberg in the southeast, Steglitz-Zehlendorf in the south, Spandau in the west, the district includes the inner city localities of Charlottenburg and Halensee. As of 2012, the borough had a population of 326,354, of whom about 110,000 were of non-German origin. The largest ethnic minorities were Turks at 4%, Poles at 3. 5%, former Yugoslavians and Afro-Germans at 2. 5% each, Russians at 1. 5%, and Ukrainians and Iranians at 1. 0% each. Charlottenburg-Wilmersdorf is divided into seven localities, The localities of Schmargendorf, Air Berlin has its headquarters in Building 2 of the Airport Bureau Center in Charlottenburg-Nord. As of 2006 Air Berlin employed 1,200 employees at its headquarters, germania has its headquarters in Charlottenburg-Nord. It was played at the Olympiastadion in Berlin, Germany, on 6 June 2015, between Italian side Juventus and Spanish side Barcelona. For the second time – after 2010 – both teams came into the final with the possibility of winning a treble, having won their national league. Barcelona scored the goal of the first half after four minutes. Ten minutes after the interval, Juventus equalised with a goal by Álvaro Morata, in the 68th minute, Luis Suárez put Barcelona back in the lead, and the final score of 3–1 was confirmed when Neymar scored with the last kick of the game. It was Barcelonas fifth trophy in the competition, and sealed their second treble, as winners, Barcelona earned the right to play against the winners of the 2014–15 UEFA Europa League, Sevilla, in the 2015 UEFA Super Cup, and won that match 5–4. They qualified to enter the 2015 FIFA Club World Cup in Japan as the UEFA representative, the Olympiastadion was announced as the venue for the final at the UEFA Executive Committee meeting in London on 23 May 2013. This was the first European Cup/Champions League final hosted in Berlin, the current Olympiastadion was built for the 1936 Summer Olympics in the western part of the city. Since 1985, the stadium has hosted the finals of both the DFB-Pokal and its female equivalent, the Olympiastadion hosts the Internationales Stadionfest, which was an IAAF Golden League event from 1998 to 2009. The stadium hosted the 2009 World Championships in Athletics, aside from its use as an Olympic stadium, the Olympiastadion has a strong footballing tradition, having been the home ground of Hertha BSC since 1963. It was used for three matches at the 1974 FIFA World Cup, and was renovated ahead of the 2006 tournament, at which it hosted six matches and this was the eighth European Cup/UEFA Champions League final for both Juventus and Barcelona. Juventus won two of their previous finals and lost five, while Barcelona won four of their previous finals, Barcelona played in six Cup Winners Cup finals, while Juventus played in one Cup Winners Cup final and four UEFA Cup finals. The two teams had played six times in UEFA club competitions, but never in a final. They played in the 1952 Latin Cup semi-finals, won by Barcelona 4–2, similar to the 2010 UEFA Champions League Final, both teams entered the final in the possibility of winning the treble of domestic league, domestic cup and Champions League titles. Juventus were crowned champions of the 2014–15 Serie A on 2 May, Barcelona were crowned champions of the 2014–15 La Liga on 17 May, and won the 2015 Copa del Rey Final thirteen days later. While it would have been the first treble for Juventus, Barcelona had previously won the treble in 2008–09, note, In all results below, the score of the finalist is given first. As winners of the 2013–14 Serie A, Juventus qualified automatically for the group stage and they were seeded second in Group A featuring – in seeded order – Atlético Madrid and Malmö FF. Their campaign began on 16 September, hosting Malmö at the Juventus Stadium, winning 2–0 through second-half goals by Carlos Tevez. The 2006 FIFA World Cup Final was a football match that took place on 9 July 2006 at the Olympiastadion, Germany, to determine the winner of the 2006 FIFA World Cup. Italy beat France on penalties after the match finished 1–1 after extra time, frances Zinedine Zidane was sent off in his last-ever match, for headbutting Italys Marco Materazzis chest in retaliation to Materazzis verbal provocation. The opening performance was by singers Shakira and Wyclef Jean, who performed a version of Hips Dont Lie called The Bamboo Version. The final started with each side scoring within the first 20 minutes, Zinedine Zidane opened the scoring by converting a controversial seventh-minute penalty kick, conceded by Marco Materazzi, which glanced off the underside of the crossbar and into the goal. Materazzi levelled the scores in the 19th minute, a header from six yards following an Andrea Pirlo corner from the right, France appeared to be the side with better chances to win because of the higher number of shots on goal. They were unable to capitalise and the remained at one goal each. At the end of the regulation 90 minutes, the score was level at 1–1. Italian keeper Gianluigi Buffon made a potentially game-saving save in time when he tipped a Zidane header over the crossbar. As Zidane and Materazzi were jogging up the close to each other. Moments later, Zidane suddenly stopped, turned around and head-butted Materazzis chest, although play was halted, referee Horacio Elizondo did not appear to have seen the confrontation. According to match reports, fourth official Luis Medina Cantalejo informed Elizondo of the incident through his headset. After consulting his assistants, Elizondo issued Zidane a red card in the 110th minute and it marked the 14th overall expulsion of Zidanes career, and joined him with Cameroons Rigobert Song as the only players ever to be sent off during two separate World Cup tournaments. He became the fourth player red-carded in a World Cup final, extra time produced no further goals and a penalty shoot-out followed, which Italy won 5–3. The 2011 FIFA Womens World Cup was the sixth FIFA Womens World Cup competition, the world championship for womens national association football teams. It was held from 26 June to 17 July 2011 in Germany, Japan won the final against the United States on a penalty shoot-out following a 2–2 draw after extra time and became the first Asian team to win a FIFA World Cup. The matches were played in nine stadiums in nine host cities around the country, sixteen teams were selected for participation via a worldwide qualification tournament that began in 2009. 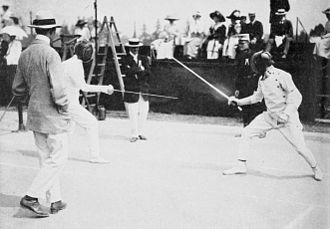 In the first round of the tournament finals, the competed in round-robin groups of four teams for points. These eight teams advanced to the stage, where two rounds of play decided which teams would participate in the final. Six nations, Canada, Germany and Switzerland, the German Football Association announced its hopes to host the tournament on 26 January 2006, following a pledge from German Chancellor Angela Merkel to fully support a potential bid. All six nations officially announced their interest by a 1 March 2007 deadline, the final bidding dossiers had to be handed over before 1 August 2007. Switzerland withdrew on 29 May 2007, stating that Europe is heavily focused on France and Germany, on 27 August 2007, France withdrew, reportedly in exchange for Germanys support for their bid to host the mens UEFA Euro 2016. Later Australia and Peru voluntarily dropped out of the race as well, leaving only Canada, on 30 October 2007, the FIFA Executive Committee voted to assign the tournament to Germany. Canada was eventually awarded the 2015 Womens World Cup four years later, after the German Football Association expressed its intention to bid for the Womens World Cup,23 German cities applied to host World Cup games. Twelve cities were chosen for the official bidding dossier handed over to FIFA in August 2007, on 30 September 2008, the DFB executive committee decided to use nine stadiums for the tournament, the original candidates Essen and Bielefeld were not chosen as World Cup venues. The Olympic flame is a symbol of the Olympic Games. Commemorating the theft of fire from the Greek god Zeus by Prometheus, its origins lie in ancient Greece, the fire was introduced at the Games of the IX Olympiad 1928 in Amsterdam and it has been part of the modern Olympic Games ever since. The first fire of the Olympic Winter Games was introduced at the IV Olympic Winter Games 1936 in Garmisch-Partenkirchen, the Olympic Torch today is ignited several months before the opening ceremony of the Olympic Games at the site of the ancient Olympics in Olympia, Greece. Eleven women, representing the Vestal Virgins, perform a celebration at the Temple of Hera in which the torch is kindled by the light of the Sun, its rays concentrated by a parabolic mirror. The torch briefly travels around Greece via short relay, and starts its transfer to the host city after a ceremony in the Panathenaic Stadium in Athens, the Olympic Torch Relay ends on the day of the opening ceremony in the central stadium of the Games. The final carrier is often kept unannounced until the last moment, the final bearer of the torch runs towards the cauldron, often placed at the top of a grand staircase, and uses the torch to start the flame in the arena. 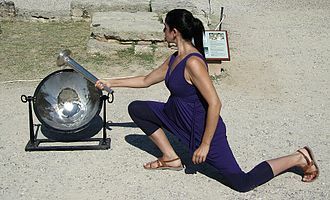 It is considered to be an honor to be asked to light the Olympic flame. After being lit, the continues to burn throughout the Games, until the day of the closing ceremony and celebration. In the time of the games within the boundaries of Olympia. For the ancient Greeks, fire had divine connotations—it was thought to have stolen from the gods by Prometheus. Therefore, fire was present at many of the sanctuaries in Olympia. During the Olympic Games, which honoured Zeus, additional fires were lit at his temple, the modern Olympic flame is ignited at the site where the temple of Hera used to stand. The tradition was reintroduced during the 1928 Games, an employee of the Electric Utility of Amsterdam lit the first Olympic flame in the Marathon Tower of the Olympic Stadium in Amsterdam. 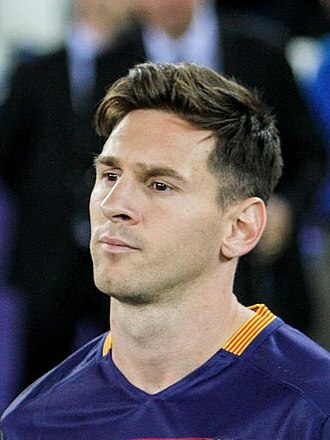 Lionel Messi scored ten times in Barcelona's progress to the final, including a hat-trick away to APOEL. Karl-Heinz Riedle was named as the ambassador for the final. Cüneyt Çakır was the final's referee.